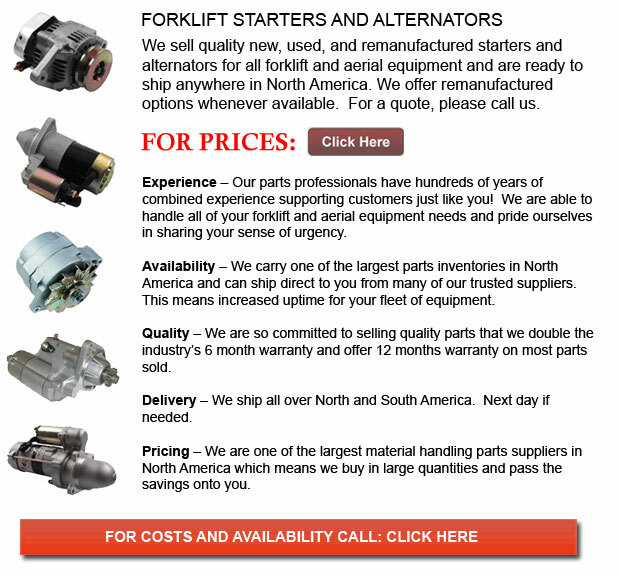 Forklift Starter and Alternator - Today's starter motor is usually a permanent-magnet composition or a series-parallel wound direct current electrical motor together with a starter solenoid installed on it. When current from the starting battery is applied to the solenoid, basically through a key-operated switch, the solenoid engages a lever which pushes out the drive pinion which is located on the driveshaft and meshes the pinion using the starter ring gear that is found on the engine flywheel. The solenoid closes the high-current contacts for the starter motor, that begins to turn. When the engine starts, the key operated switch is opened and a spring inside the solenoid assembly pulls the pinion gear away from the ring gear. This action causes the starter motor to stop. The starter's pinion is clutched to its driveshaft by means of an overrunning clutch. This allows the pinion to transmit drive in only a single direction. Drive is transmitted in this particular method through the pinion to the flywheel ring gear. The pinion remains engaged, for instance in view of the fact that the operator did not release the key as soon as the engine starts or if the solenoid remains engaged for the reason that there is a short. This actually causes the pinion to spin independently of its driveshaft. This above mentioned action stops the engine from driving the starter. This is actually an important step for the reason that this particular kind of back drive will enable the starter to spin so fast that it would fly apart. Unless modifications were made, the sprag clutch arrangement would prevent the use of the starter as a generator if it was employed in the hybrid scheme discussed prior. Normally an average starter motor is meant for intermittent use that will stop it being used as a generator. The electrical parts are made in order to function for about 30 seconds so as to prevent overheating. Overheating is caused by a slow dissipation of heat is due to ohmic losses. The electrical components are meant to save weight and cost. This is the reason the majority of owner's handbooks meant for automobiles suggest the operator to stop for at least 10 seconds right after each and every 10 or 15 seconds of cranking the engine, when trying to start an engine that does not turn over right away. In the early 1960s, this overrunning-clutch pinion arrangement was phased onto the market. Before that time, a Bendix drive was used. The Bendix system operates by placing the starter drive pinion on a helically cut driveshaft. As soon as the starter motor begins turning, the inertia of the drive pinion assembly enables it to ride forward on the helix, therefore engaging with the ring gear. As soon as the engine starts, the backdrive caused from the ring gear enables the pinion to exceed the rotating speed of the starter. At this moment, the drive pinion is forced back down the helical shaft and therefore out of mesh with the ring gear. During the 1930s, an intermediate development between the Bendix drive was developed. The overrunning-clutch design which was made and introduced during the 1960s was the Bendix Folo-Thru drive. The Folo-Thru drive consists of a latching mechanism together with a set of flyweights inside the body of the drive unit. This was an enhancement for the reason that the standard Bendix drive used so as to disengage from the ring once the engine fired, even though it did not stay functioning. The drive unit if force forward by inertia on the helical shaft when the starter motor is engaged and begins turning. Next the starter motor becomes latched into the engaged position. As soon as the drive unit is spun at a speed higher than what is achieved by the starter motor itself, like for example it is backdriven by the running engine, and then the flyweights pull outward in a radial manner. This releases the latch and permits the overdriven drive unit to become spun out of engagement, hence unwanted starter disengagement can be prevented previous to a successful engine start.